Why Does Joe Biden Have This Baby's Pacifier in His Mouth? 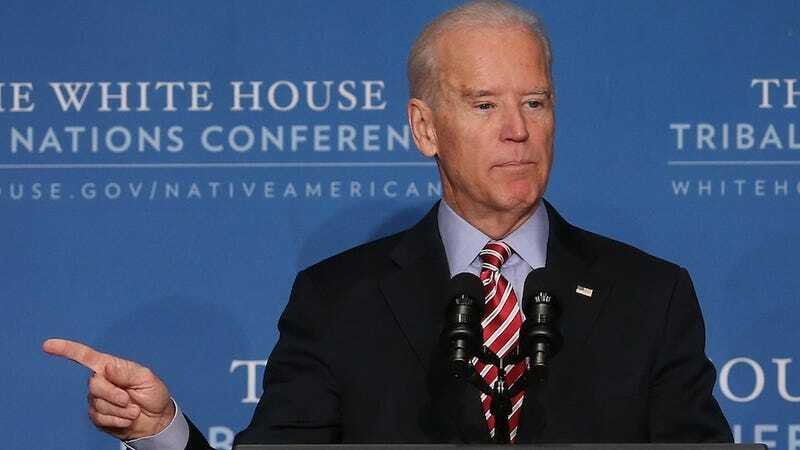 Photographic evidence suggests that Joe Biden recently put a baby’s pacifier into his very own mouth. He was not related to the baby. Georgina Bloomberg, daughter of billionaire and former New York City mayor Michael Bloomberg, took the photo and posted it on Facebook. That is her son, Jasper, looking perplexed as he stares at a man he does not yet know as the vice president of these United States. He only knows him as the adult who has, rudely, just stolen his binkie, thereby upsetting the natural order of little Jasper’s universe. According to Business Insider, Biden recently attended a ceremony in Washington, D.C., where Grandpa Bloomberg was made an honorary knight of the United Kingdom. Presumably that is where this photo was taken and also explains why Jasper is wearing a three-piece suit. It seems Joe Biden shares the same kids-and-germs philosophy as one of my parents, who will remain anonymous (it’s my mother), who once admitted that when our pacifiers fell out she’d pop them in her own mouth right quick and them stick them back in ours. I’M FINE, OKAY.